This week’s featured resource is Access to What? 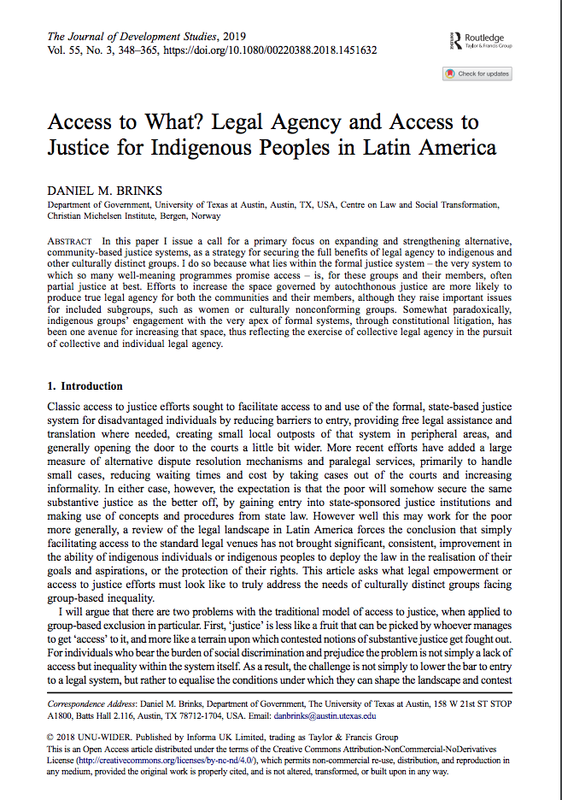 Legal Agency and Access to Justice for Indigenous Peoples in Latin America by Daniel M. Brinks from the Journal of Development Studies. This resource issues a call for a primary focus on expanding and strengthening alternative, community-based justice systems, as a strategy for securing the full benefits of legal agency to indigenous and other culturally distinct groups. Classic access to justice efforts sought to facilitate access to and use of the formal, state-based justice system for disadvantaged individuals by reducing barriers to entry, providing free legal assistance and translation where needed, creating small local outposts of that system in peripheral areas, and generally opening the door to the courts a little bit wider. More recent efforts have added a large measure of alternative dispute resolution mechanisms and paralegal services, primarily to handle small cases, reducing waiting times and cost by taking cases out of the courts and increasing informality. In either case, however, the expectation is that the poor will somehow secure the same substantive justice as the better off, by gaining entry into state-sponsored justice institutions and making use of concepts and procedures from state law. However well this may work for the poor more generally, a review of the legal landscape in Latin America forces the conclusion that simply facilitating access to the standard legal venues has not brought significant, consistent, improvement in the ability of indigenous individuals or indigenous peoples to deploy the law in the realisation of their goals and aspirations, or the protection of their rights. This article asks what legal empowerment or access to justice efforts must look like to truly address the needs of culturally distinct groups facing group-based inequality. Thank you for sharing this ressource because there are very few resources on legal empowerment of minorities and indigenous peoples. This will enrich our knowledges on them.